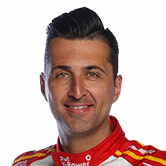 DJR Team Penske’s Fabian Coulthard has recorded the fastest lap in opening practice at the Wilson Security Sandown 500. His 1min09.1233 lap bettered Prodrive’s Chaz Mostert by 0.0858 seconds in a critical half-hour session. Practice One is the first of three sessions today, but is the only one the primary driver is allowed to contest, with co-drivers taking over for the afternoon. It was a clean session though drivers pushed the limits of their Supercars, with Red Bull Shane van Gisbergen and Jamie Whincup close in positions three and four and Lucas Dumbrell Motorsport young gun Andre Heimgartner taking a surprise fifth. 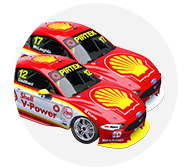 Both DJR Team Penske cars are embracing ‘retro round’ with Coulthard’s throwing back to an important part of Penske history. “It’s good inspiration, Roger’s first Indy 500 win … it’s special because 66 is the number I had through go karts,” he said. Mostert was surprised to finish P2 but said the car felt good straight out the gate. Garth Tander challenged for the top time in the second half of the session but the Holden Racing Team cars finished 15th (James Courtney) and 16th. Returning racer Lee Holdsworth finished 20th, while defending Supercars champion and 2015 Sandown winner Mark Winterbottom was 23rd. The primary drivers will now hand over to the co-drivers for the day’s remaining two practice sessions.